This oregano-flavoured macaroni salad is sure to please pasta lovers. Boil the macaroni in sufficient water along with 1/2 teaspoon of salt and 1 tablespoon of oil. Drain thoroughly, wash and cool. Add the remaining salad ingredients and mix. Just before serving, add the dressing and toss. Serve cold, garnished with olives. 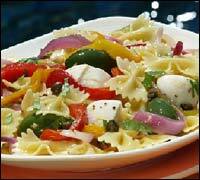 Handy Tip: With vinaigrette dressing take 1/2 teaspoon oregano or curry sauce.